I toldja I'd do better about updating! Of course, I already had this inked and on my computer for months...but that's how it goes. Okay, anyway. Page. 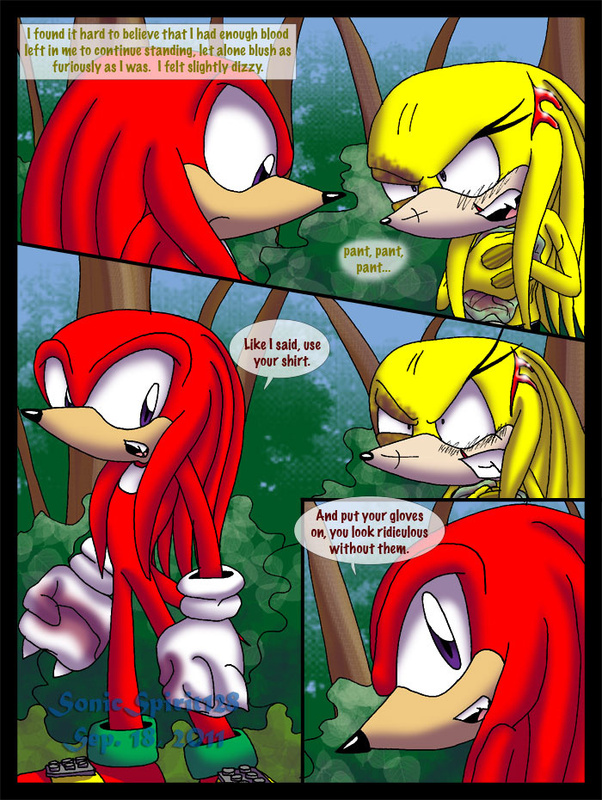 It was fun trying to get just the right amount of smirk on Knux's face in that last panel. On one hand, he knows Ki's severely injured, and suffering from at least shock, and soon emotional trauma. On the other...he just stopped being the last echidna (as this is set in a separate universe from Archie and the games 'verse, with Sonic Chronicles: Dark Brotherhood). He's kinda enjoying himself immensely. And for once he stopped being the last echidna in a situation where the other echidna isn't a villain, for once. Not that he'd know that. Eh, nothin' else really to say on this page. The next one's got Tails in it! Ooh! I thought of something else! Narrower panel dividers in this page! Whooooo!